The main attraction at the New Zealand International Film Festival this year in terms of children’s film was Ernest and Celestine, winner of the 2013 Cesar award for Best Animated Film, and hot off positive reviews at the San Francisco International Film Fest. The film centres on the story of supposed enemies turned unlikely companions: Celestine, a feisty mouse, and Ernest, a gruff bohemian bear become friends, much to the consternation of their respective mouse and bear communities. The appeal of the sketchy hand-drawn watercoloured animation would’ve been enough to pique my interest on its own; the fact that the film is based on Gabrielle Vincent’s series of picture books raised my curiosity exponentially. Except… the film feels like an adaptation virtually in name only. The title and the species of the central characters, and their affection for each other, are the only features faithful to the books, which are so bare-bones in their narrative content as to make feature-film adaptation virtually impossible. Nevertheless, their pretty illustrations and partly distressing, partly compelling narrative content have made the books – for me at least – vivid childhood memories. There are over twenty entries in the Ernest and Celestine series, first published in Vincent’s native Belgium between 1981 and 2000, of which only ten or so have been translated into English. This sets my completist urges into overdrive – who wouldn’t want to know how a story like Ernest et Célestine ont des Poux (Ernest and Celestine Have Lice) pans out? So, in contrast to the film, in Vincent’s books the story-world is one where the film’s separate mouse and bear societies are quite absent. Instead, we are shown a frequently snow-bound small town European setting, somewhere in an indeterminate past, where all the adults are bears and all the children are mice. Paternal Ernest is possibly relation, possibly guardian to Celestine, a volatile murine child. The text is sparse, consisting of only dialogue – usually a line or so accompanying each picture; though Breakfast Time, Ernest and Celestine! and Ernest and Celestine’s Patchwork Quilt are text-free. This sparseness in text leaves the bulk of the narrative and emotive content to be conveyed by the pictures. 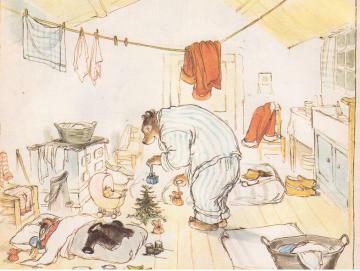 All watercolour and line drawings, the settings are finely detailed but not busy: while Ernest and Celestine’s home is full of domestic clutter it is also largely characterised by wide expanses of bare yellow floorboards; while an exterior might depict a packed city street there will always be extensive uses of white space. A comparison reviewers have commonly made is to E.H. Shepard’s illustrations, and in tone this is not far off the mark, though Shepard’s use of white space usually tells you about that space, whereas the overall effect in Vincent’s pictures is to centre the action squarely on the characters’ emotional life. A miniscule brushstroke will convey huge changes in mood, from an eager slightly opened mouth to a miserable elongated eye. Over the course of the books the illustrations become more clean and polished, the colours brighter, the lines more assured. This is not necessarily an asset – the roughness of the line, particularly in the first book, Ernest and Celestine, makes the characters seem far more kinetic. When Celestine discovers the loss of a favourite toy and pulls Ernest’s hand, desperate to go back and look for it, her whole body points, seeming to drag all of Ernest’s sketchy bulk behind her. The minimal plots of these books definitely follow a formula. A benign domestic activity or interaction will cause the highly capricious Celestine to become upset; Ernest will kindly and patiently help solve the issue and restore Celestine’s good cheer. As mentioned, in Ernest and Celestine, this involves Celestine losing Gideon, a cherished toy bird. Ernest retraces their steps and finds Gideon ruined in the snow. His attempts to buy replacements for the doll are no consolation to Celestine, until, with her design help, Ernest sews a replica Gideon and harmony is reinstated. In Merry Christmas, Ernest and Celestine! the fun of an eagerly awaited Christmas gathering is threatened by the presence of Celestine’s older cousin Max, a big kid who hides his embarrassment at being at a little kid’s party by being rude, though eventually, through Ernest’s hard work, the party is a success. Bravo, Ernest and Celestine! inverts this narrative – Celestine suggests the two solve financial troubles by coaxing an unwilling Ernest into busking, helping him overcome his stage fright and making their street performance a success. Even when in the capable role though, Celestine’s passion is the driving force, tempered by Ernest’s stoicism: part of the comfort and pleasure in these books is that the characters are always consistent. This is not to say that they are entirely comforting texts, however. It’s likely that as a similarly volatile child I identified overly with Celestine, that the emotional realism was too resonant; in any case, I found that the things that upset Celestine tended to narratively overpower Ernest’s parental ability to right them. 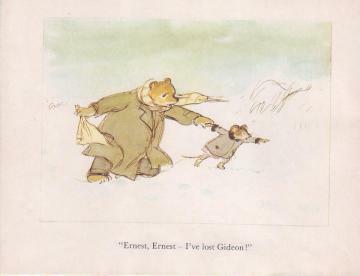 Ernest’s pronouncement that Gideon is ‘ruined’ in Ernest and Celestine is troubling – as most who have been or who know children recognize, a beloved toy has to be practically disintegrating for it to be ruined in the eyes of the child that loves it. Cousin Max’s dismissal of the Christmas decorations Celestine has laboured over – “some baby must’ve made them” – seems so devastatingly mean that Max’s eventual apology and involvement in the party is pretty cold comfort. That sort of minor, casual bullying is such a common part of childhood interactions that – for an adult reader – it would be easy to miss how a realistic portrayal of it might sting. Similarly, Celestine’s worries in Smile Please, Ernest and Celestine! that Ernest has photographs of other children but not of her, are palpable, while Ernest’s explanation that he had worked at a summer camp seems anti-climactic, given Celestine’s distress. In a recent Radio New Zealand review of the books, Kate di Goldi referred to children’s lit critic Peter Hunt’s concept of the differing modes of address found in children’s books, positing that Vincent employs a ‘direct’ mode, speaking to the child reader about childhood concerns to the exclusion of adult ones. This would account for why adult reviewers find the books cute, comforting, sentimental, and often miss the distressing elements. Instead, numerous reviewers have commented on the inter-species family or friendship the books present, and the incongruities with regards to this. Is Ernest, Celestine’s father? Why do the two have clearly human postures, hands and feet? In Where are you, Ernest and Celestine?, why does the statuary in the art gallery depict bears, but the paintings show the familiar human figures of the Mona Lisa and Millet’s Gleaners? 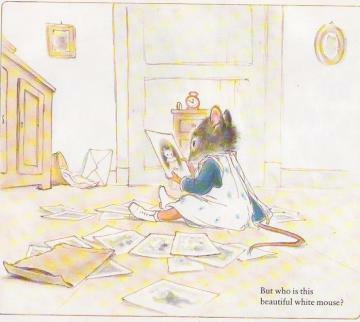 And why, in Smile Please does the consistent depiction of children as mice break when Celestine looks at Ernest’s baby photos, all of which show a cuddly Edwardian bear cub? In 1986 the New York Times Book Review argued that these inconsistencies raise a case against the books’ anthropomorphism, and that, as Ernest and Celestine are “symbols of a parental figure and child” we lose a sense of them as individuated characters. I disagree – firstly, the realism of the story-world in terms of setting and emotion means that the anthropomorphic family unit are easy to readily accept. Secondly, Ernest and Celestine’s function as symbols is arguably why the stories are relatable: I don’t think I would’ve identified with Celestine’s anxieties so easily if they had been more clearly species specific to her character. The same with Ernest: Kirkus Reviews describes him as “fatherhood personified in a floor-length red bathrobe”, which doesn’t mean that is all he is, but it is his primary function in the books. An unusual aspect of Vincent’s stories is that a consistent feature is Ernest and Celestine’s poverty, though this is by no means a central feature. It never feels as though Vincent is particularly drawing attention to the character’s struggles, though they are often a catalyst for events which shape how the stories progress. This aspect is handled with a subtlety and sincerity that is rare to see in children’s literature. 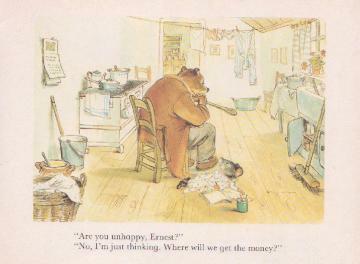 In Bravo, Ernest and Celestine!, for instance, a leaking roof causes worry for Ernest, who has no money to pay for it (I especially love his response to Celestine – “no, I’m just thinking” – when she asks if he is upset. It’s absolutely the response a caring adult gives to a child enquiring about adult problems). The denouement of the story – once they have made money busking – also feels accurate to their financial situation, where instead of fixing the roof, they buy each other presents. It’s a tender gesture of people who aren’t used to having money: you treat yourself or each other because you aren’t sure when you’ll be able to do so again. Other problems associated with caring for a child while being poor are also dealt with realistically and with an empathic eye. Decorations, costumes and presents have to be scrounged and made rather than bought in Merry Christmas! ; while in Where Are You? what is otherwise a fairly familiar story of a child getting lost in public kicks off with Ernest going for a job interview at an art gallery, which he is turned down for as he will not be able to bring Celestine to work with him, and they have no other option but to leave her at home alone. Interestingly, the aforementioned distressing aspects of the books never arise directly from the two being poor, rather, for the child-proxy Celestine, it is just one of the aspects of their life together. It is a little disappointing that in the film, Ernest and Celestine’s poverty appears to be, if not absent, a different flavour to what is found in the books – that it is due not to circumstance, but rather to Ernest being kind of a bohemian hot mess. In this frame, he’s not a struggling single parent figure, but an unreliable, ungainly and buffoonish street musician. While this is clearly completely out of step with Vincent’s creation, it could possibly be explained away by the reasoning that this is a prequel to the books’ events. More plausible, though, is that co-director Benjamin Renner has a very different reading of Ernest and Celestine’s relationship. In an interview with the British Film Institute, he says that in the books “the characters are very much like two children”. Which uh…no? One wonders what Vincent herself would’ve made of an adaptation of her work. She appears to have been a fiercely private person, asking in a promotional letter in 1986 that readers not demand commentary from her: “I beseech you not to ask me to leave my table continually. Protect my pleasure in drawing. Rejoice in your ability to peruse the books’ pages. Everything is contained therein.” What little is known is that she was born Monique Martin (Vincent is a nom de plume) in 1928 in Brussels, where she later attended the Academy of Fine Arts. She died in 2000. There is no Wikipedia page for her in English, and the French entry is scanty. I don’t speak French, but the translated summary of her books, in the garbled poetry only Google Translate is capable of, reads: “the engines of her work are the strength of sobriety related to tenderness colours”. Seems pretty succinct.